This paragraph explains how the famous Armenian saint replaced idol-worship in Caucasia with feast-days for the saints. See similarly Agat’angełos, §§ 48ff., and on Anahit and Aramazd, see Thomson’s remarks in the introduction to his edition and translation of Agat’angełos, pp. xxxviii-xlii. (For an earlier report on Anahit among the Armenians, see Strabo 11.14.16.) Anahit is in other places identified with the Greek Artemis, but here with Aphrodite. Gregory the Illuminator, of course, was hardly the only idol-basher in the early centuries of Christianity. For Theodosius as one, for example, see Movsēs Xorenac’i, History of the Armenians, § 3.33 (Thomson, ET, p. 286). For a general reflection, see lines 867-884 of Grigor Magistros’ poem recently edited and translated by Abraham Terian: Magnalia Dei: Biblical History in Epic Verse by Grigor Magistros, Hebrew University Armenian Studies 14 (Leuven: Peeters, 2002; ET pp. 61-62, comm. pp. 98-99, Arm. 161-162). Saint Gregory, the Illuminator and great Patriarch of all Armenia, overthrew all the statues of the idols and removed demon-worship from the land of the Armenians, Georgians, and Albanians, and as a substitute he founded churches in the name of the holy Mother of God, Mary, and the holy forerunner, John [the Baptist], and he changed the feasts of impurity to feasts of holiness. [The feast is today] because while the land was in idol-worship, on this day [Aug 25] they would celebrate Lady Anahit and they would call her the offspring of her husband Aramazd; she was Aphrodite among the Greeks. Adishi რამეთუ იყოს დიდ წინაშე უფლისა და ღჳნოჲ და სათრობელი და იყი არა სუას და სულითა წმიდითა სავსე იყოს მიერვე მუცლით დედისა თჳსისაჲთ. PA რამეთუ იყოს დიდ წინაშე უფლისა და ღჳნოჲ და თაფლუჭი არა სუას და სულითა წმიდითა აღივსოს მიერვე დედისმუცლით მისითგან. At რამეთუ იყოს დიდ წინაშე უფლისა და ღჳნოჲ და თაფლუჭი არა სუას და სულითა წმიდითა აღივსოს მიერვე დედისმუცლით მისითგან. რ(ამეთუ) იყოს დიდ წ(ინაშ)ე ო(ჳფლ)ისა და ღჳნოჲ და თაფლოჳჭი არა სუას და ს(უ)ლითა წ(მიდ)ითა აღივსოს მიერვე დედისმოჳცლით მისითგ(ა)ნ. Since, alongside Greek, both Armenian and Syriac enter into discussions of the textual lineage of the Georgian Gospels, I’ll give them both here, too. For Syriac, the Old Syriac (Sinaiticus), the Peshitta, and the Ḥarqlean all have simply ḥamrā w-šakrā lā neštē. In Armenian, this part of the verse reads, գինի եւ աւղի մի́ արբցէ. 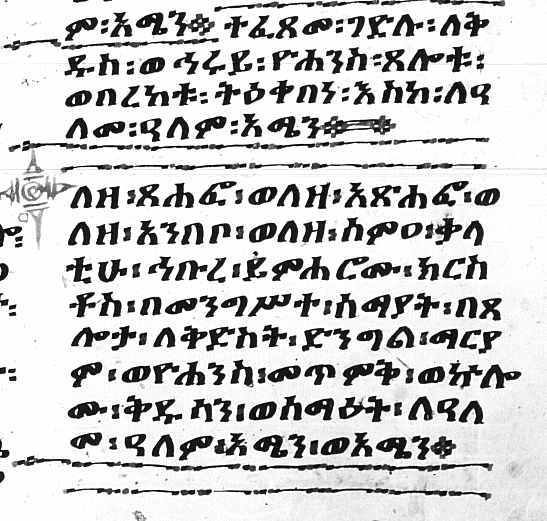 So the witnesses for this verse in both of these languages give simply a bipartite prohibition, just like the two later Georgian versions, not a tripartite one like that of the Adishi text. As pointed out above, the word that stands sometimes in the Georgian versions for σίκερα (traditionally “strong drink”, but probably better, “beer”) is თაფლუჭი “mead”, derived from the word თაფლი “honey”. As is well known, mead is a thing and a word with a long history in at least some Indo-European societies (see Pokorny; Buck, Synonyms, §§ 5.84, 5.91). The modern English “mead” goes back to medu in Old English, where there are many derivatives appearing in Beowulf and elsewhere (all of these in Bosworth-Toller), e.g. (“Honey” itself in OE is unrelated: hunig; see PIE *kₑnəkó- “golden” in Pokorny.) Here are a few other words of the same origin as this word medu in other IE languages (PIE *médhu-). Sanskrit madhu- was used for sweet drinks, including soma, and in line with Avestan maδu- is the Middle and later Persian may “wine” (Mackenzie 55, Steingass 1357). Greek μέθυ (> μεθύω to be drunk > μεθύσκω to make drunk) is a poetic word for wine; it does not mean “mead”. (The latter is μελίτειον, as in Plut. Quaest. Conv. 672b: καὶ μέχρι νῦν τῶν τε βαρβάρων οἱ μὴ ποιοῦντες οἶνον μελίτειον πίνουσιν. Mod. Gr. has ὑδρόμελι like Latin hydromeli, with derivatives in the Romance languages). In Russian, “honey” is мёд (for the color, cf. медь “copper”). The Slavic words for “bear” derive partly from this root, e.g. Russian медведь (honey-eater; cf. Buck, § 3.73). (In Old Georgian, “bear” is დაფჳ [modern დაფვი], as in 1Sam 17:34 JerLect. The word does not sound dissimilar to თაფლი “honey”: should we posit a direct etymological link?) Note that Chubinov/ჩუბინაშვილი (Грузинско-Русско-Французскій Словаръ/Dictionnaire géorgien-russe-français [Saint Petersburg, 1840], 220) defines თაფლუჭი with “сикера” — σίκερα! — and “медовика”. The first noun is, of course, “wine”, and the second is cognate with OE līþ, “strong drink” (cf. the first element in German Leithaus). Եւ տեսեալ զբազումս ի սադուկեցւոցն եւ ի փարիսեցւոց եկեալս ի մկրտութիւնն նորա, ասէ ցնոսա· ծնունդք իժից, ո՞ ցոյց ձեզ փախչել ի բարկութենէն որ գալոցն է։. [და] ვითარცა იხილნა ფა[რ]ისეველნი და ს[ად]უკეველნი, მომავალნი ნათლის-ღებად მისგან, ჰრქუა მათ: ნაშობნო იქედნეთანო, ვინ გიჩუენა თქუენ სივლტოლაჲ მერმისა მისგან მომავალისა რისხვისა? და ვითარცა იხილნა მრავალნი ფარისეველნი და სადუკეველნი, მომავალნი ნათლის-ღებად მისგან, ჰრქუა მათ: ნაშობნო იქედნეთანო, ვინ გიჩუენა თქუენ სივლტოლაჲ მერმისა მისგან რისხვისა? γεννήματα ἐχιδνῶν, πῶς δύνασθε ἀγαθὰ λαλεῖν πονηροὶ ὄντες; ἐκ γὰρ τοῦ περισσεύματος τῆς καρδίας τὸ στόμα λαλεῖ. Ծնունդք իժից· զիա՞րդ կարիցէք բարիս խաւսել որ չարքդ էք· քանզի ի յաւելուածո́յ սրտի խաւսի բերան։.։. ნაშობნო იქედნეთანო, ვითარ უძლოთ კეთილისა სიტყუად? რამეთუ თქუენ უკეთურნი ხართ, რამეთუ ნამეტავისაგან გულისა პირი იტყჳს. ნაშობნო იქედნეთანო, ვითარ ჴელ-გეწიფების კეთილისა სიტყუად, რამეთუ თქუენ უკეთურნი ხართ? რამეთუ ნამეტავისაგან გულისა პირი იტყჳნ. Աւձք, ծնունդք իժից զիա՞րդ փախնուցուք ի դատաստանէ գեհենին։. გუელნო, ნაშობნო იქედნეთანო, ვითარმე განერნეთ სასჯელსა გეჰენიაჲსასა? გუელნო და ნაშობნო იქედნეთანო, ვითარმე განერნეთ საშჯელსა მას გეჰენიისასა? 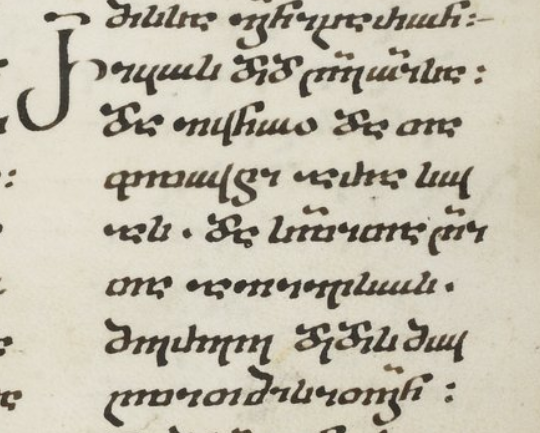 I have often enough here referred to colophons in Syriac and Arabic, but here is a simple example of one in Gǝʿǝz, from The Beheading of John the Baptist in EMML 2514 (written in the 1380s CE), f. 43r. Finished is the Combat [gädl] of the holy and elect John. May his prayer and blessing protect us forever and ever, amen! May Christ have mercy in the kingdom of heaven on the one who has copied it, the one who has commissioned its copying, the one who has read it, and the one who has heard its words, through the prayer of the holy virgin, Mary, John the Baptist, and all the saints and martyrs, forever and ever, amen. And, as usual, there is a wish that this or that saint’s prayer (ṣälot) and blessing (bäräkät) protect (ʿaqäbä) the scribe, etc. A typological study of colophons in eastern Christian manuscripts from all the languages has, as far as I know, yet to be written, but it would be a worthwhile topic of investigation.